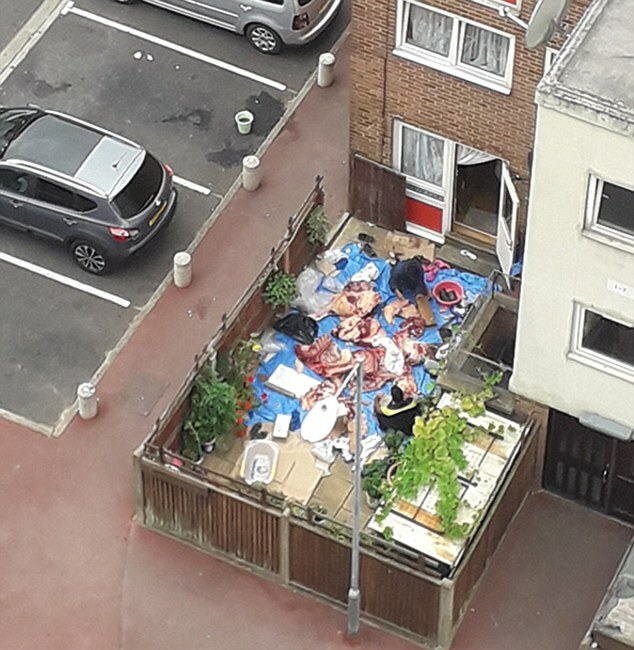 A ground floor flat in East London may seem an unlikely place for a makeshift butchers. 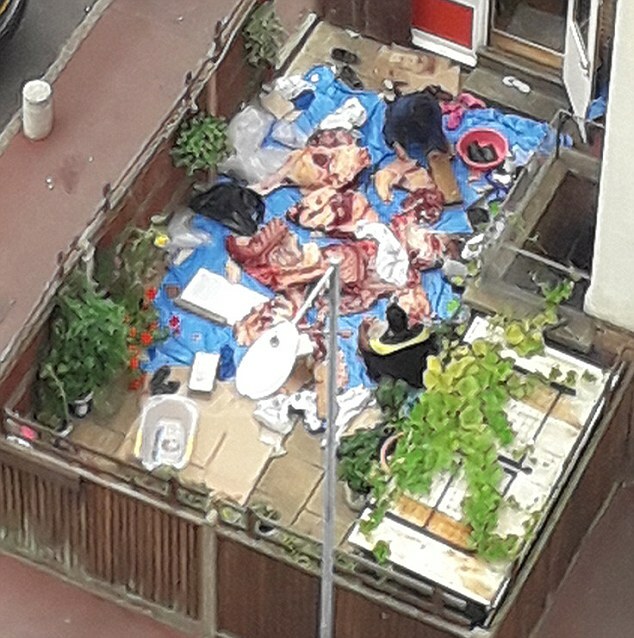 But one family thought to be celebrating Eid al-Adha, the Muslim festival of sacrifice, were spotted hacking up animal carcasses in their back garden. They now face a hygiene probe after neighbours in Dagenham filmed them and alerted environmental health officials. Mohammed Shafiq, chief executive of the Ramadhan Foundation, told The Sun that the family had done nothing wrong and were simply practising their religion. It is tradition for Muslim families to sacrifice an animal such as a sheep or goat and divide it into portions at Eid al-Adha. The United Nations Food and Agriculture Organisation, however, has strict guidelines on the slaughter of animals, which it says must be carried out in abattoirs ‘situated away from residential areas’. The killings must take place in ‘a well-planned, well-executed and controlled cleaning and sanitation programme’. It is not known whether the family had slaughtered the animals at home, or bought the bodies from elsewhere to butcher them in their garden. An aerial-view image of the backyard reveals slabs of raw meat laid out on a blue tarpaulin. Two men appear to be attending to the carcasses. Julia McClenaghan, 62, whose flat overlooks the yard, described the scene. Barking and Dagenham Council said it was investigating. A woman at the property confirmed they had been butchering for Eid but denied any wrongdoing. Eid al-Adha falls on the tenth day of the 12th month in the holy Muslim calendar. An animal – a sheep, cow, goat or camel, depending on the region – is sacrificed to Allah to show that man is willing to sacrifice something they hold dear to emphasise their piety. The animal is usually cut into thirds. One portion of meat is given to the poor, another to friends and relatives and the final third is eaten by the family. The bloodied fleeces and entrails of up to 63 ewes and lambs were found dumped in a village in Essex yesterday. It is not thought the discovery had any relation to Muslim sacrificial practices carried out during Eid al-Adha. Police instead feared raiders had stolen and butchered the sheep for their meat to sell on the black market and left the remains on the roadside. Residents in Takeley were horrified when they found the organs after 27 ewes and 36 lambs were stolen from a field 40 miles away in Lindsey. A spokesman for the National Farmers Union said: ‘Livestock thefts on this scale are still relatively rare in East Anglia but nationally they cost farmers £2.4million in 2017, according to rural insurer NFU Mutual.